If you are not sure if you already have a TIN number, you can easily verify it using the official website of the Bureau of Internal Revenue (BIR). First of all, TIN is an acronym for Taxpayer Identification Number and this is the number assigned to you when you first registered with the BIR. Always keep in mind that it's against the law to have more than one TIN numbers. This is why it's very important that you verify if you already have a number before registering or applying for another one. There's a chance that your previous employer acquired a TIN for you and you are not aware of it. 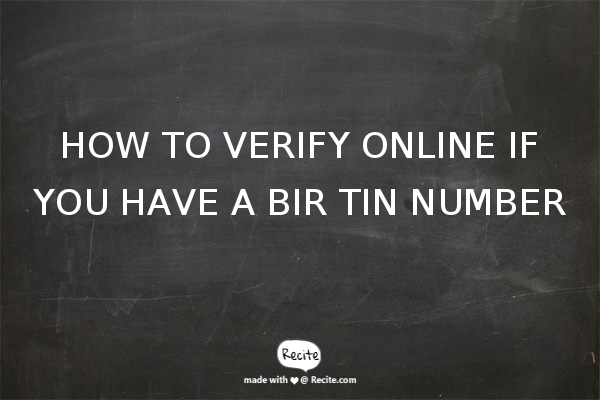 Below are the steps on how you can verify if you already have a TIN using the BIR website. Take note that the steps will only verify if you have a TIN or not. It will not show you the number itself. You will have to go to a BIR office to get the numbers. Step 1 - Visit the official BIR website and go to the eRegistration System. Fill up the form there and click on the submit button. Make sure that you have a valid email because the form requires you to enter an email address. Step 2 - Wait for the form to be processed. This can take just a few seconds. If you receive the following notification, it means that you are already registered and that you have a TIN number. All you have to do now is go to the nearest BIR office and request for your TIN. "Thank you for visiting eREGISTRATION SYSTEM. The name [your name] you are trying to register have a similar record in the BIR database which may have been previously registered with the BIR. Please proceed to the RDO/LTD having jurisdiction over the place of your company/business for verification/manual registration and submit the appropriate BIR Form, complete documentary requirements and a printed copy of this confirmation message. For further BIR concerns/inquiries please contact our Customer Assistance Division (CAD) at 981-7003,981-7020,981-7030,981-7040,981-7046 or email them at contact_us@bir.gov.ph." Tip: If your name is not in the database, you can also use the eRegistration System to register, apply, and get a new TIN. However, take note that the system only caters to self-employed individuals, single proprietors, professionals, and mixed income earners.